Vivian looks happy but is it because she and Zoe are on better terms or another reason? 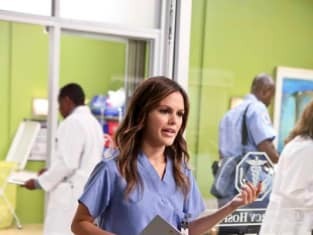 "Something to Talk About" is ninth episode of Hart of Dixie's third season. 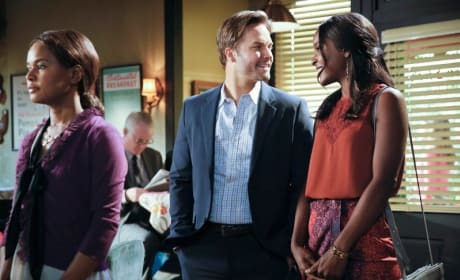 Annabeth and Lavon come up with a crazy plan to stop the merger on Hart of Dixie. "Something to Talk About" is the ninth episode of the show's third season. George does what he can to stop the Bluebell merger on Hart of Dixie. "Something to Talk About" is the ninth episode of the show's third season. Zoe doesn't look happy about her conversation with Wade on Hart of Dixie. "Something to Talk About" is the ninth episode of the show's third season. What are Zoe and Rose discussing on Hart of Dixie? "Something to Talk About" is the ninth episode of the show's third season. Looks like Zoe and Vivian run into Wade on Hart of Dixie. "Something to Talk About" is the ninth episode of the show's third season. Are Vivian talking about tennis, Bluebell or Wade on Hart of Dixie. "Something to Talk About" is the ninth episode of the show's third season.